I’ve been a little tardy in updating the blog of late. There are a couple of reasons for me getting behind. The first is that I’ve been heavily involved in planning our Cape SR Series. It’s actually been a lot of fun devising the routes, but also quite a lot more work than I’d have ever expected – plotting out possible routes, and then refining them to come up to full BRM distance and ensure that they have adequate control points. The most time consuming part by has been cue card creation though. And just as I put the final touches the last ride, I found that RideWithGPS has a possible near automatic way of generating them for me. Oh well, at least it gives me something to tinker with for future rides. The second reason for neglecting the blog is that as part of the Audax admin I’ve also been writing up ride reports for other sites. 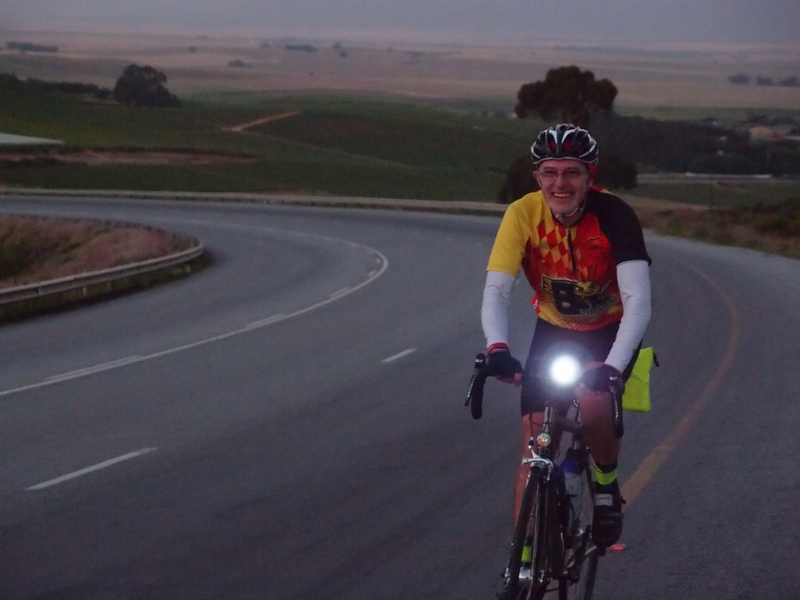 For the Cape 300km ride, I actually ended up two slightly different versions of the ride – one for the Audax SA site; and another for my cycle club newsletter. In a pathetic attempt to catchup with minimum additional effort, I’ve pasted both of these in below. Slightly chilly and blustery at the start, once dawn broke the chill lifted and it was a glorious sunny day, quite hot across the middle of the afternoon. Headwind was only really an issue up Franschhoek pass where it was very strong at times, and then occasionally on the leg to Rawsonville. After that, the wind lessened. When it did pick up later in the day it was a helpful tailwind into Hermon, dying down nicely for the final stretch from Malmesbury. Moonlight helped visibility for first couple of hours at the start, but good lights still needed, and especially later on for the final night time stretches. Also grew quite chilly again on the last 30km or so home, especially in the fog hollows between rollers. Routing worked well in general. 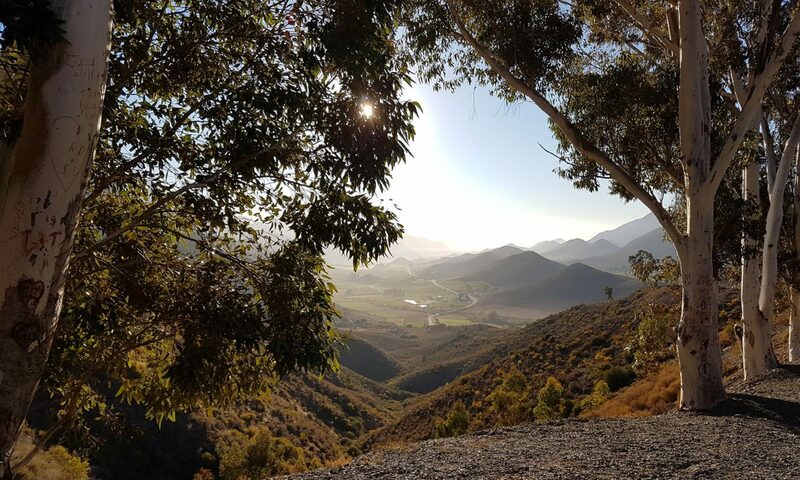 There is a stretch with no safety lane for the last few Km into Villiersdorp, and then again once down the pass until about half way to Brandvlei Dam. Traffic was a little heavy along those sections, and also at the start of Slanghoek. Once past the wineries though the traffic was noticeably lighter! Despite being narrow, the climb back over Bain’s Kloof Pass had light traffic, and most cars gave enough passing room. 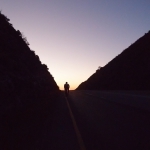 Road surfaces in places are a bit rough, but nothing too nasty: there is a stop go section on Franschhoek pass with rough stone chips; and the last part of the descent of Bain’s Kloof needs some care with some bumps and holes in the shade of trees that at speed could be a hazard. Aside from these, nothing more than a wary eye for occasional potholes needed. The smooth tar on the R304 just before the 4-Way stop for Durbanville was truly a delight for sore bums! The scenery on the route is stunning – but this does not come for free! 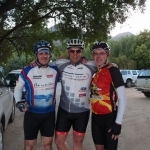 The two big climbs of Franschhoek and Bain’s Kloof Passes are needed to earn that reward. They do add some challenge, but not to the extent of making control close times unreasonably tough. Satisfactory. The late start meant that the Galleria coffee shop in Villiersdorp was open. This is directly opposite the Shell 24 hour next to Remax. They do a decent coffee and bacon toastie – well worth watching out for, especially if you need to fix a mechanical anyway! Rawsonville has a range of shops to get water and supplies – along the road in Slanghoek are more options if a sit down and hot food are needed. The winery our group tried was closed for a wedding so we pushed on to the bush pub at the foot of Bain’s Kloof for a beer before the climb. The Shell in Wellington has a takeaway Steers that proved ideal for a quick refuel. Riebeeck Wes does have a nice looking café/pub at the start of town – but our group just refilled with water and rode on to the Engen in Malmesbury for a Wimpy before the last leg home. Don’t try and convince the server your dog is a guide dog though – serious lack of humor on that! You had to be there to understand how canine accompaniment was acquired on an Audax ride. The distance came out to 305.6km measured on the road, a shade over calculations but ideal for what is needed. Additionally, the ride started around 30 minutes late – in part this was a bit of faffing around, and also uncertainty over whether to wait for expected riders. For the future, a standard process for late arrivals will be followed of leaving brevets and cue cards in a visible spot on the Vrede stoep. Added to the late start was an early mechanical, which meant that by the time Villiersdorp was reached around 1 hour had been lost. Even with this the control close time was made, and by Rawsonville the group had pulled back to an hour ahead of schedule. This margin was easily maintained through the rest of the ride, even with a relaxed pace. 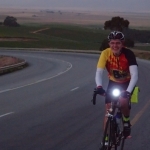 Minor revisions will be made to the cue sheet before the February 2015 300km ride to adjust for distance, and also correct a signpost cue in Rawsonville. The cue needs to read ‘SP Slanghoek’ – the Goudiniweg sign is now straight on, which could be confusing. Of the 6 or 7 riders expected, only 3 arrived on the day. This did make it a very easy call to all stay together as a group though, which made for a thoroughly excellent day of cycling in great company. The group was joined by Emmerentia Jacobs at Wellington to act as safety vehicle for the remainder of the ride. This was most welcome, especially as night time fell on the stretch into Malmesbury. It really was immensely reassuring to have the comfort of a safety car keeping an eye on us at intervals on the final stretch down the R304. A massive thanks to Emmerentia. Definitely need to find a way to cajole some volunteers for at least the homeward/night time stretch of future rides. 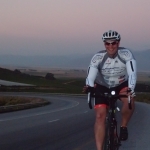 As we gathered for last Wednesday’s club ride, John asked me to write a piece on the recent 300km Audax for his last newsletter as club chairman. Having agreed though, it feels something of a missed opportunity to simply re-hash official ride report already up on the Audax SA website. So at the risk of incurring a second chairman’s warning in as many months, I’m going to intentionaly mis-interpret his request and use this short piece to also try and show some of the ways an Audax ride is different to the road races we are all used too. The natural place to start is, well, at the start. At the start of say an Argus, 35,000 of us line up in waves at the tape. The gun shot hasn’t finished echoing around the buildings before cleats are stamped into pedals and the mass charge of riders heads for that tunnel. From that point on, the clock is everything. The official 4am start of our BRM (Brevet Randonnee Mondial) 300km was a rather more sedate affair. In fact no one was actually on a bicycle: the 3 of us who’d pitched were still standing around drinking coffee, admiring each others machines and waiting for late arrivals. An Audax ride, you see, is not a race. Starting 30 minutes late may not ideal, but the cutoff time is sufficiently relaxed that it isn’t a disaster either. Lights, plenty of them, and backup lights, plenty of those too. All but the shortest Audax rides involve a significant amount of night time riding. In our case, the day’s riding would be bookended with 2 hours or so of dark riding into Franschhoek, and several hours home from Malmesbury. Hence our bikes have multiple front and back lights. Night time riding for me, and many others, is one of the real highlights of Randonneuring – peaceful riding with the occasional hoot or silent fly-by of an owl. Bags too, we have big bags on our bikes as well. It might seem crazy to start such a long ride carrying 5 or 6kg more than normal, but those bags are way more than just dead weight. They carry the essentials to get you to the end, whatever the road throws at you. 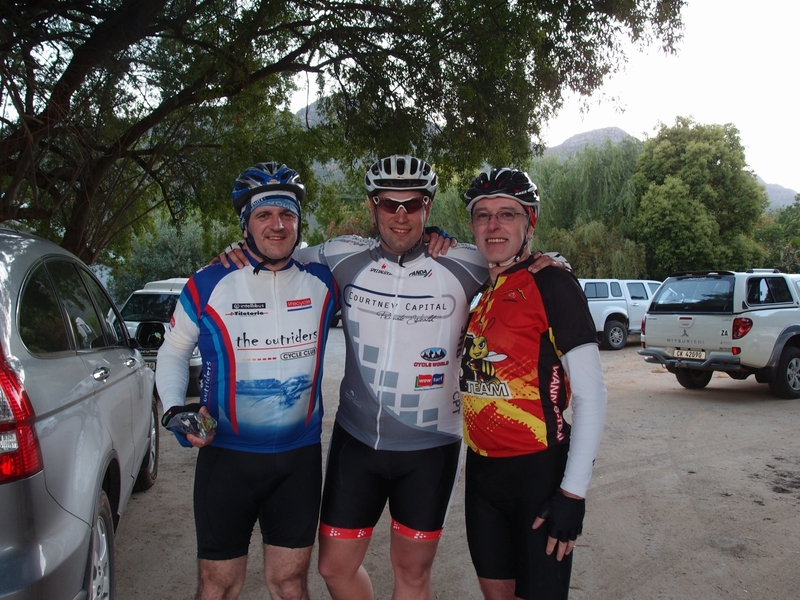 In our case, the road threw us it’s worst early – a shredded rear tyre before we’d even got over Franschhoek Pass. We rolled into our 1st control point in Villiersdorp with the replaced inner tube already flat, and it was clear the tyre needed replacing. The first step in fixing an Audax mechanical is differemt too – you sit down, get a drink and something to eat. Early in a ride it’s less essential, but 20+ hours into a longer event with a foggy brain it’s the best way to avoid a costly mistake. We were now nearly an hour behind schedule and only minutes before the control closing time. Nevertheless we followed procedure. Instead of getting our control (aka brevet) cards signed at the Shell garage, we went over to the Galleria coffee shop opposite and ordered breakfast. Yes, you may laugh, but buried somewhere in that big bag of stuff is a spare tyre. Always carried and seldom used, but ride saving when needed. As it was this time. Fixed, fed, and fresh we rode on. 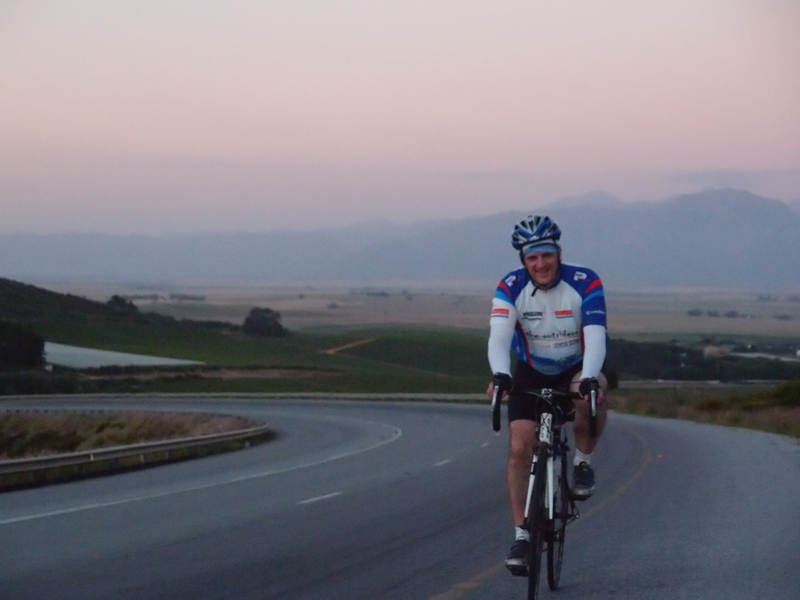 And here’s how relaxed an Audax time schedule is – we left Villiersdorp right up against the time limit, and rolled into our 2nd control point at Rawsonville having pulled back an hour on the schedule. In between we’d been treated to glorious rolling scenery and clear blue skies – it was turning into a beautiful day. Your main choices for proof of passage are having your brevet card signed or collecting till or ATM receipts at the controls. In my case, having forgotten to pick up the supermarket slip for my water and coke, I accosted an unsuspecting member of the shop staff on a cigarette break in the alley. I’m not sure she had any idea what she was signing, but she smiled and thanked me all the same! Our 3rd control was some way down the road In Wellington. We’d planned a drink stop in the impossibly picturesque Slanghoek valley, but our chosen winery was closed for a wedding. Fortunately the Calabash Bush Pub has been rebuilt and was open for business a few kilometers down the road at the foot of Bains Kloof. The afternoon was becoming properly hot by this stage – it would have been rude to have ridden past and not sampled their hospitality. So we pulled in for a beer – just the tonic ahead of the second big climb of the day. The climb up and over Bains Kloof is truly one of the Cape’s most majestic stretches of tar to see from a bike saddle, especially on a bright sunny day. It’s easy to find your front wheel wandering dangerously close to the edge as your eyes rise up to enjoy the view. The road is a little narrow in places, but the traffic was light and all except maybe one or two cars passed us with plenty of space. The run down the other side into Wellington is a long blast of snaking turns, several of them sharp enough to raise the heart rate if you sweep into them carrying too much speed. The road surface is testing at speed too – especially in the dappled light of the stands of trees towards the bottom. The Shell in Wellington was our 3rd control, or more accurately in our case the take-away Steers in it’s forecourt – as we loaded up on calories for the remainder of the ride. 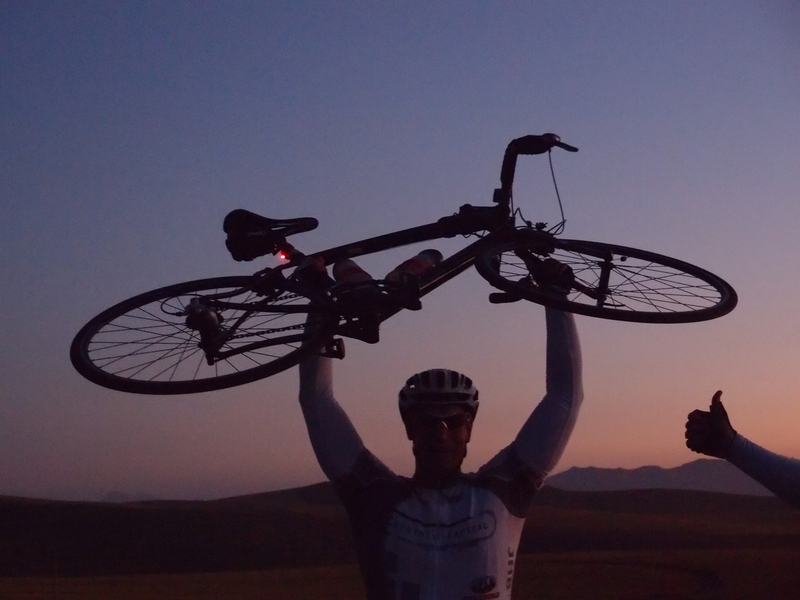 With 190km down, we only had an Argus left to do. 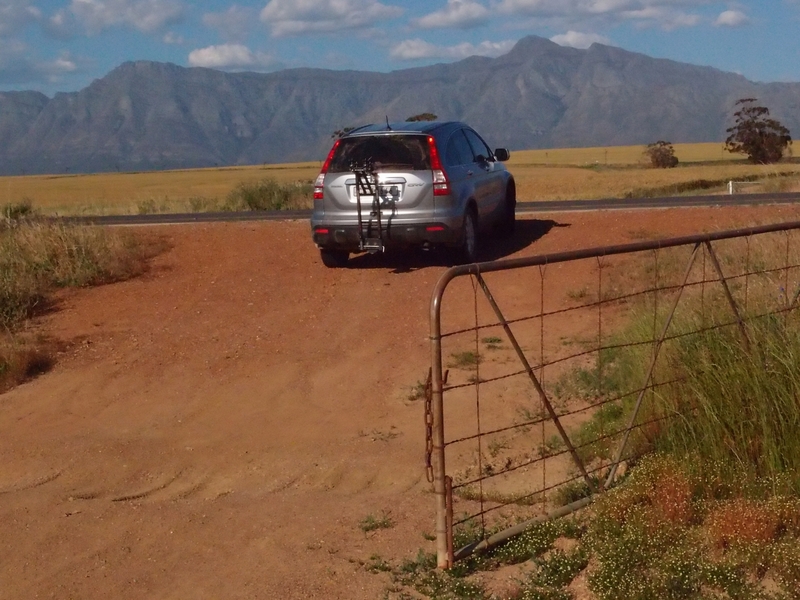 And we’d have company from here on as Emmerentia Jacobs, a seasoned randonneur herself, had joined up to drive safety car for the rest of the ride. It was most welcomed as we headed out towards Hermon with shadows lengthening in the late afternoon light. 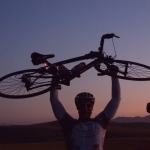 Despite the extreme distances, Randonneuring is not really a physical challenge, it’s a mental one. Everyone hits low spots, and finishing a ride is about finding a way through them. We were about 10km out from our 4th control when Peter hit his. The tell-tale signs of gradually dropping speed, and eyes fixed on the tar ahead were painful to watch. At these points it’s all too easy to just give up without really understanding what is going wrong. Luckily, in this case, we spotted the cause – full water bottles. With persistent nagging to drink, the risk of a DNF gradually faded from view as we rolled into Riebeeck West, our 4th control. The pub looked inviting, but we all wanted to get over Bothmaskloof before the light was completely gone. 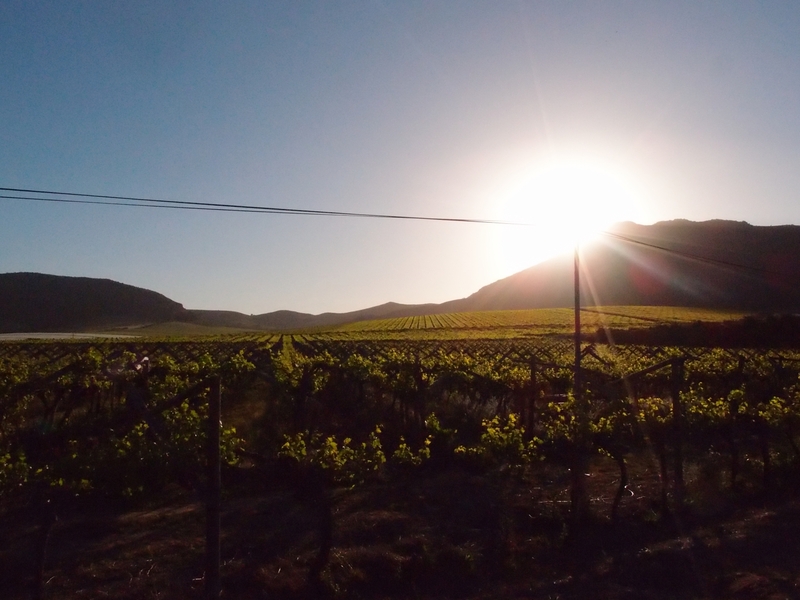 As it happened, we crested the climb to see the last orange glow of sunlight low on the horizon – Swartland’s rolling hills laid out below, with odd clumps of mist gathering in the hollows. 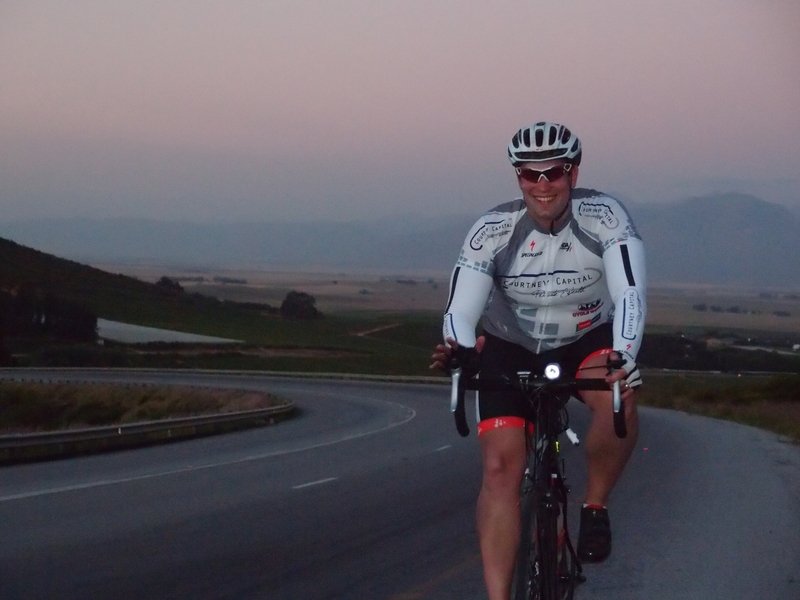 It was fully dark by the time we reached the Engen in Malmesbury – the 5th and penultimate control of the day. More importantly for us though was the Wimpy inside. What can I say? Audaxing needs a lot of calories to be enjoyed properly, and despite our leisurely pace we still had that hour in hand we’ d earned earlier in the day. So we sat and enjoyed coffee and toasties, Emmie joining us too before the last leg home. The R304 in the dark of the evening was probably the quietest stretch of road all day – both in traffic terms, and literally. It was peaceful, serene and becoming chilly as a large red moon rose over the hills to our left. We rolled into the Arrivée (fancy terminology for the last control) at 23:13, 47 minutes inside the cutoff time. And here really is the final difference to a road race. Coming in close to the cut-off of an Audax ride has no connotations of a slow time – in fact quite the reverse. You have earned your very own piece of Audax terminology – you are deemed a ‘full value‘ rider. A phrase recognising someone who has enjoyed everything the event had to offer.